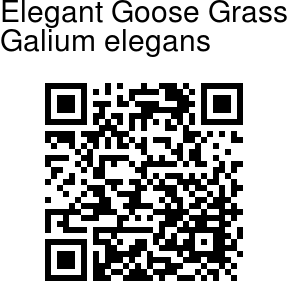 Elegant Goose Grass is a spreading perennial herb which is prostrate or trailing. Stem is 4-angled, softly velvet-hairy at least on angles. Leaves are stalkless, 4 in a whorl, ovate-elliptic, 1-3 x 0.5-1.5 cm, pointed, blunt or mucronate, distinctly 3-nerved, not recurved, dotted and velvety above, hairy beneath, sometimes on nerves and margins only. Inflorescence consists of terminal or axillary, divaricately or trichotomously branched cymes. Peduncles and flower-stalks are threadlike; bracts leaf-like, smaller than leaves, flower-stalks 1-3 mm long. 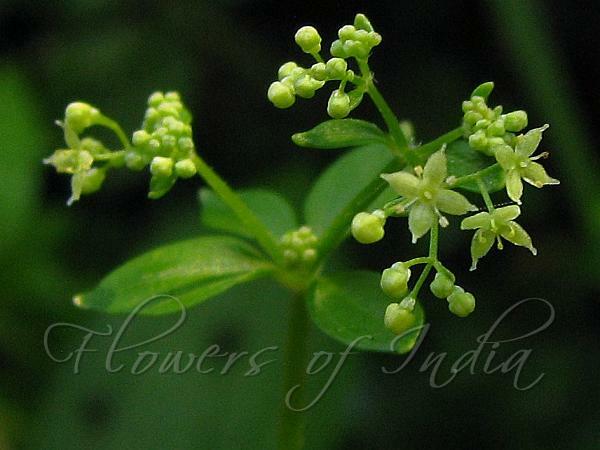 Flowers are white or yellowish, minute, 2-2.5 mm in diameter. Petals are lanceolate, acute, one-nerved. Fruits are small, about 0.5 mm, globose, covered with soft whitish hooked bristles. Elegant Goose Grass is found in the Himalayas, at altitudes of 200-3500 m. Flowering: July-October.